Wean your Baby off the Rock n Play to Happily Sleeping in the Crib! 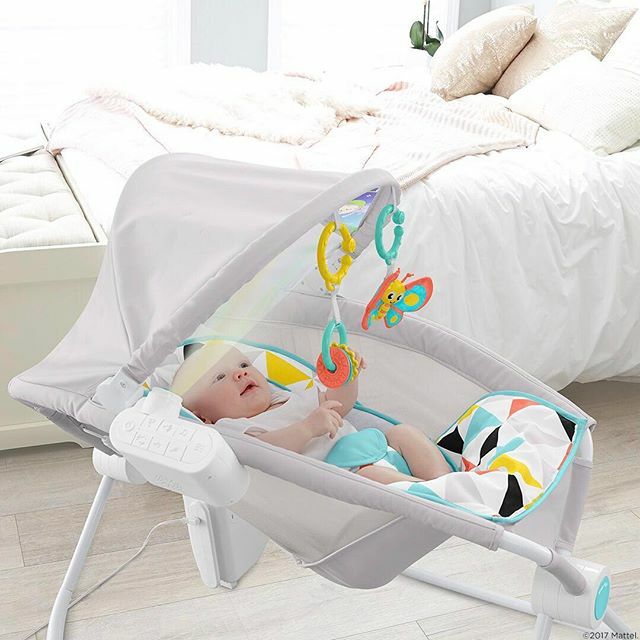 On April 12, 2019 Fisher Price recalled all Rock n Plays due to infant deaths while sleeping in them. This was a big shock for parents given the fact that the Rock n Play is one of the most popular baby products in the U.S. The Rock n Play is a chair that reclines, vibrates and rocks. Many parents of babies with reflux turn to the Rock n Play as a sleeper. Slight elevation can relieve reflux pain. The AAP has come out and stated that the Rock n Play is NOT a safe sleep space for your baby. So, if your little one sleeps in the Rock n Play, it’s time to transition out of it and into the crib! This option is for babies who are showing signs of starting to roll or parents who want to get rid of the Rock n Play asap. Option B: Wean over the next few days. PLEASE make sure your baby is not yet attempting to roll and you use the safety harness at all times. If you prefer to take a few days to wean off the Rock n Play, the rest of this article will guide you through what to do. The first thing to do is wean baby off needing vibration to sleep. Turn down the vibration one level each day. If your baby has been sleeping at level 5, turn it down to level 4 tonight, and level 3 tomorrow, etc.. Turn off the vibration 20 minutes after baby is asleep. You want to get her used to sleeping in a motionless space. If baby wakes, use vibration to get her back to sleep. Switch it off again once she’s fallen asleep. Now it’s time to get your baby sleeping in her crib. Since your baby is used to sleeping in a small and cosy sleep space, I recommend you use a specialized sleep sack to aid this transition. NOTE: This isn’t for babies who are fully rolling. It’s for babies who have tried at least once to wiggle, flip or roll. Place your baby in the crib with her feet touching one end, so that she feels some boundaries. We often put baby right in the center of the crib, but if your little one liked the cosy Rock n Play she’ll sleep better feeling some boundaries. There’s no real way of doing this. But by the time you have weaned off the vibration and containment, you’ve done most of the hard work. Your baby may need more hands-on comforting during this transition. Rub her back, pat her bottom, or sing to her. That’s okay. Do whatever you need to so she can get used to sleeping in a new environment. Over time, reduce your hands-on support. Are you having trouble weaning your baby out of the Rock n Play? Tell me about it in the Comments below & I’ll give you some advice!